Monty is dreading the return to his father’s estate to begin learning the family business. With this one last hurrah, he embarks on his Tour with his best friend, who he secretly has a crush on, and his sister, who he can’t wait to be rid of. When he steals from the Duke as a joke, the Duke doesn’t find it funny and sends terrible men after them who do not care to collect them dead or alive. 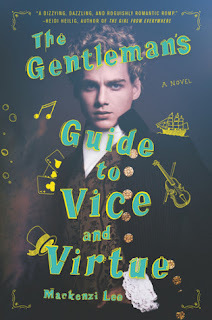 The Gentleman’s Guide to Vice and Virtue by Mackenzi Lee is an incredible adventure with lots of heart that will leave you laughing out loud and pining away for the sequel. As soon as the book opens and our protagonist is introduced, he demands to be seen. Monty reminds me a bit like Jace from The Mortal Instruments series by Cassandra Clare with his direct way of speaking, his obnoxious admiration of himself and his hilarious sarcasm that will have you in laughing fits. Monty is such a well written character. What's even more amazing is that The Gentleman's Guide to Vice and Virtue is in first perspective so we get Monty's view on a lot of things and he always has something remarkable and funny to say. The writing is tremendously easy to read. Monty becomes your best friend, someone you’ve known for a very long time. 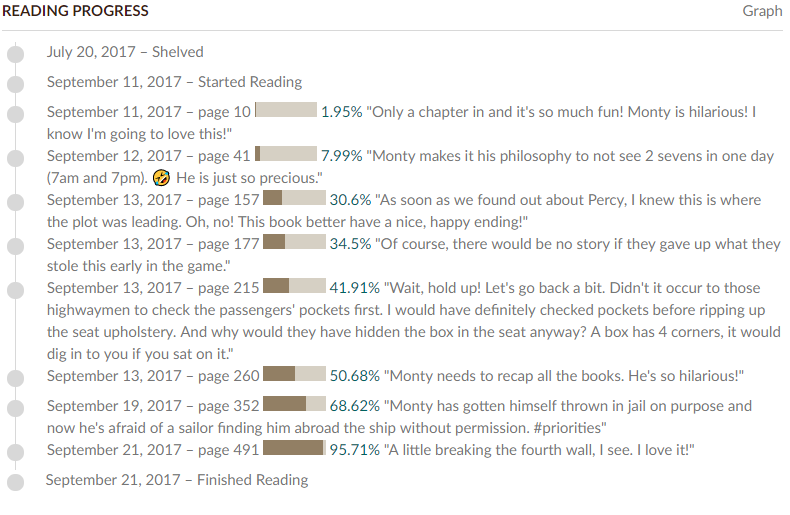 At least, Lee’s writing makes you believe so—getting to know more about Monty’s inner secrets and thoughts is as if you were having an extended sleepover with these amazing characters. It was nonstop fun. Mackenzie Lee gives readers the perfect adventure story with fantastic characters that give you all the feels and a sarcastic tone that will make you smile. Percy is so sweet. His dialogue with Monty, quick thinking and violin-playing just makes me fall in love as the book continues. Everything about his character is fantastic. Each scene is made 100 times better when he graces its pages. Pirates make an appearance and they add so many extra laughs to the story. The scenes with pirates are where Felicity really begins to shine. She's incredibly intelligent and readers are finally shown how knowledgeable she is in a variety of subjects. She is so independent and probably could run the entire operation by herself. With Monty being overdramatic about everything and Percy inside his own head, Felicity becomes the star which really gets readers excited for what's to come in the sequel. The premise of the book is so much fun. Two friends with Monty's younger sister get to travel Europe, having adventures, for an entire year. The plot is structured incredibly well. The Gentleman’s Guide to Vice and Virtue is mildly predictable. I didn't necessarily see where the story was going in the main plot; however, I did find that there was a predictable course of action in many of its cause and effects (this happened so naturally this will happen). The characters' personalities made it rather easy to guess where the story would lead to. I give the award for worst pirates to the lot in this book, however, it was entirely intended and comical. Going into the book, I did not foresee coming across pirates. Though, these particular characters fit seamlessly into the story. It will be interesting to see if Lee has the pirates return for the next book. If the sequel is anything like this, it will be absolutely epic! The Lady’s Guide to Petticoats and Piracy follows Felicity and her adventure after separating from Monty. It releases in 2018. I am so excited to read it! Be sure to read the author’s note in the end of the book. It gives readers an inside look at some of the real life histories mentioned in the book. Lee also suggests further reading, if interested. From the author’s note, it gives you the sense of how meticulous and focused a lot of the research of the book was. The author’s note made me appreciate the book even more for the extra effort that was put into its glorious pages. This book was difficult to put down. It's hilarious, with on the edge of your seat action and adventure. A definite read. Overall, despite the plot being a bit predictable, I found The Gentleman’s Guide to Vice and Virtue by Mackenzi Lee to be a fantastic journey all the same. It is an astounding story that will enchant you from the very beginning with its fun characters, amazing settings and the historical period. I'm glad you really liked The Gentleman's Guide too, Jeanna! I agree that the characters were super entertaining, and I can see the comparison between Jace and Monty. It was somewhat predicatble, like you said, but it didn't matter because it was so much fun. The author's note at the back was a brilliant insight. The research Lee did into writing this book was so thourough, and I like that she explained the tweaks she made to history and why she made them. Great review!